Updated 4/19/2017 This doesn't seem to be either a compote or a vase but collectors know it by this name. 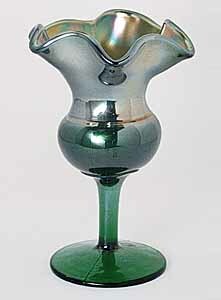 At the 1998 auction where this green example sold for $42.50, it was identified as a Westmoreland tulip-shaped plain compote. Five to six inches tall and with a rib pattern only on the interior. They're usually attributed to Fenton.